The app was updated to Version 3.0.0 on Sep. 7, 2018 1:30 a.m. (PT) / 8:30 (UTC). - Added Classic Kingdom to χ3 [ex tres] Mode. - Added Community to χ3 [ex tres] Mode. - Added Limited-Time Challenge to χ3 [ex tres] Mode. The new χ3 [ex tres] mode has been added with Version 3.0.0! 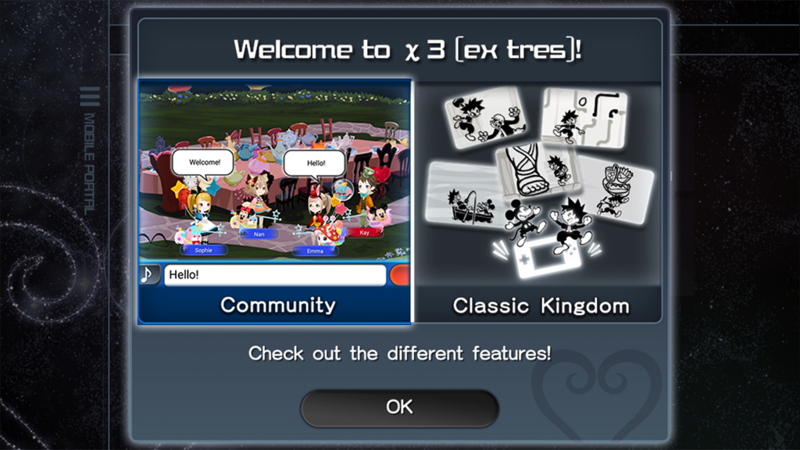 χ3 [ex tres] mode, which features a menu based on the device that Sora uses in KINGDOM HEARTS III, lets you play some of the minigames to be featured in KINGDOM HEARTS III! You can also use the Community feature to mingle and socialize with other players! *Tap χ3 [ex tres] from the title screen to access this page. *You can return to title screen by going from "MENU > Other > Title Screen" in the menu. ・The "Community" section is a place where divisions between party and Union are all forgotten, and where players from anywhere can chat together! ・You can chat about the Kingdom Hearts series, the upcoming KINGDOM HEARTS III, and share strategies for KINGDOM HEARTS Union χ[Cross]! ・By tapping your avatar icon, you can access various options to disband and manage chat rooms! * Rooms will not be disbanded even if you press the "back" button. * However, your rooms will be disbanded if you remain absent from them for an extended period of time. Get an exclusive preview of these KHIII minigames! 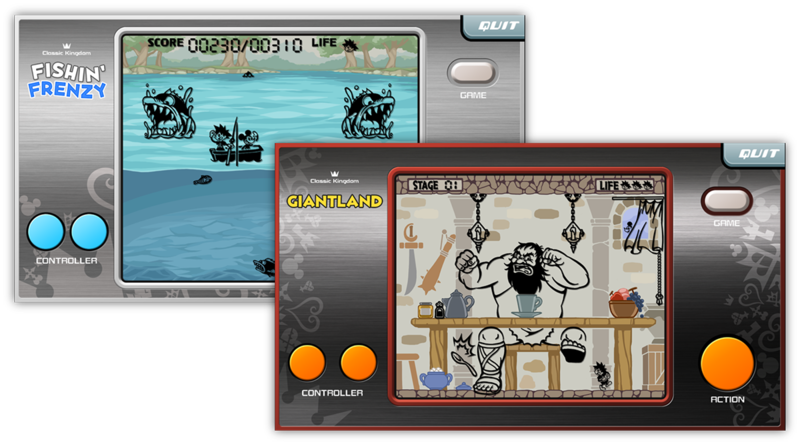 ・In "Classic Kingdom" you can play the 5 minigames that will be found in KINGDOM HEARTS III. 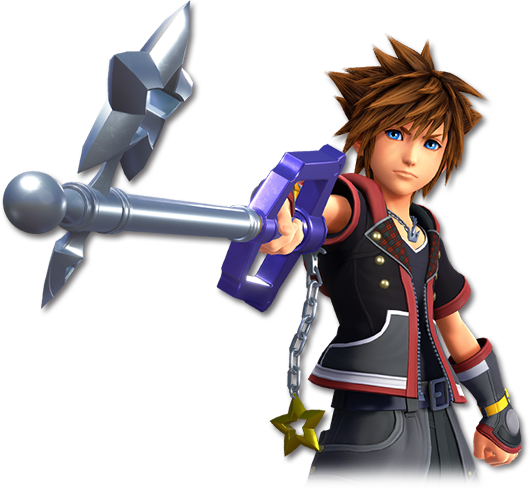 Your trusty "Starlight" Keyblade from KINGDOM HEARTS Union χ[Cross] will make a appearance in KINGDOM HEARTS III! 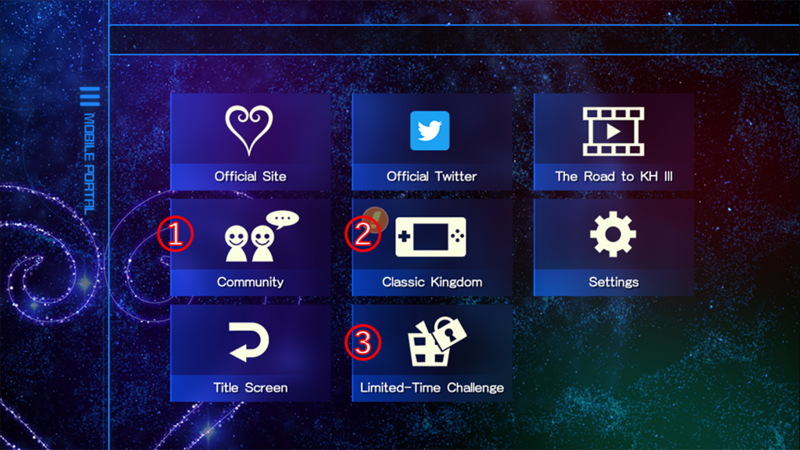 ・In this Limited-Time Challenge, by playing the "Classic Kingdom" minigames and reaching certain scores in each of them you can earn a code to unlock a Starlight Keyblade that you can use in KINGDOM HEARTS III! ★ Bonus Jewels and Special Attack Bonus Campaigns are back! Take full advantage of the following campaigns to build your Medal collection and make them even stronger! You'll also receive double the amount of Skip Tickets from your purchase! Use Skip Tickets to instantly earn rewards from Quests that you've already completed all three Objectives for! ・Skip Tickets will not be given from purchasing the Weekly Jewels Extravaganza. ★ This 7★ Deal features the Vulpes Union leader! Get Tier 8, 7★ HD Ava [EX+] within 10 draws from this exclusive Deal! HD Ava [EX+] has arrived with Tier 8 Special Attack Bonus and 5 trait slots! Get it within 10 draws from this Medal Deal! 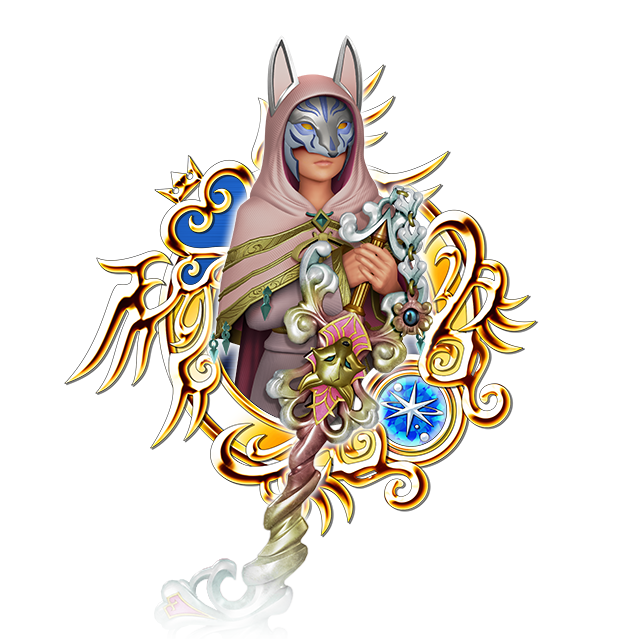 HD Ava [EX+]'s brand-new Special Attack changes the Special Attack of the Medal after it to Magic attribute! Use it to your advantage! Every time you draw from this deal, you are guaranteed to receive one Trait Medal #34! ・HD Ava [EX+] will gain a new trait. ・A 7★ HD Ava [EX+] within 10 draws! ・A Trait Medal #34 each time you draw from this banner! ・Either a Tier 5, 7★ Medal OR a Tier 8, 7★ HD Ava [EX+] per draw from this banner! ・10 Limited VIP Coins each time you draw from this banner! Check below for a full list of the possible skills 7★ HD Ava [EX+] or Tier 5, 7★ Medal could come with! ・Boosted 7★ HD Ava [EX+]: 1,000 more base Strength and Defense. Updated OP with v3.3.0 and Ï‡3 Mode! Gotta say that I'm somewhat disappointed that the pull guarantee for HD Ava EX+'s deal was changed to Tier 5 Guilt 7*s as opposed to JP's Tier 6 or 7 Guilt 7*s guarantee, though. Ugh, 10 draws? Whyyyyy. I really do need a good 7 star Magic Medal still. But I know my luck, I probably wouldn't get it. And I definitely don't have enough to pull mercy. So it turns out the notice has errors again. The SP ATK Campaign is NOT live so save your medals. I don't need the Foretellers, and won't be chasing any of them. Will be doing one pull from each, though, just for the heck of it. 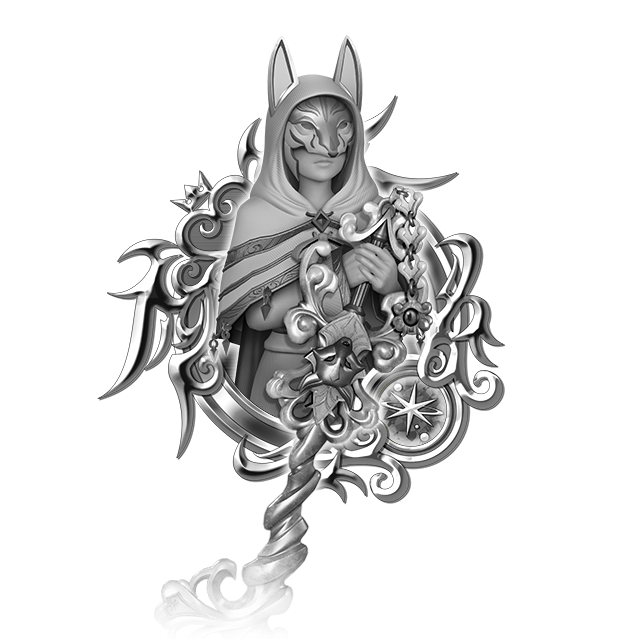 Instead, knowing that the next great Kairi mega-medal will be coming along soon enough (you know there will be another, right?? lol), I will be hoarding my jewels. Thanks to this update, there's an error where our names don't appear in the party chat. Naturally, I'm now disguised as one of my party members. Can anyone tell me if the scores needed to unlock the Starlight Keyblade are ridiculous or not? I stopped playing the game ages ago but if it's not too hard for people to get it, I might just reinstall to get that code! They are not, but more importantly, they are cumulative. You don't have to get thousands of points in a single run. Replay each game a few times and you'll eventually reach the goal. You'll have to finish the game to lock in the points though; quitting partway won't get you anything. There's also a 600 jewel reward for surpassing the target scores for each game, so by the time you fulfill all the requirements to get Starlight, you'll also be 3000 jewels richer. God I haven't played this since... February? I wonder how much has changed since it's 2nd Anniversary. I'll probably bite for the keyblade. Took me three pulls to get Ava Ex+. Uploaded it on my channel as per usual. Also just beat classic kingdom's scores today and set for Starlight keyblade in kh 3. I did 5 pulls and got crap from it, unsurprising lol. Was hoping maybe though...I hope to have enough to finish her out in the next 20 or so days she is still around.